Can Healthy Start Help You? Join us for the 25th Annual Sarasota Community Baby Shower! 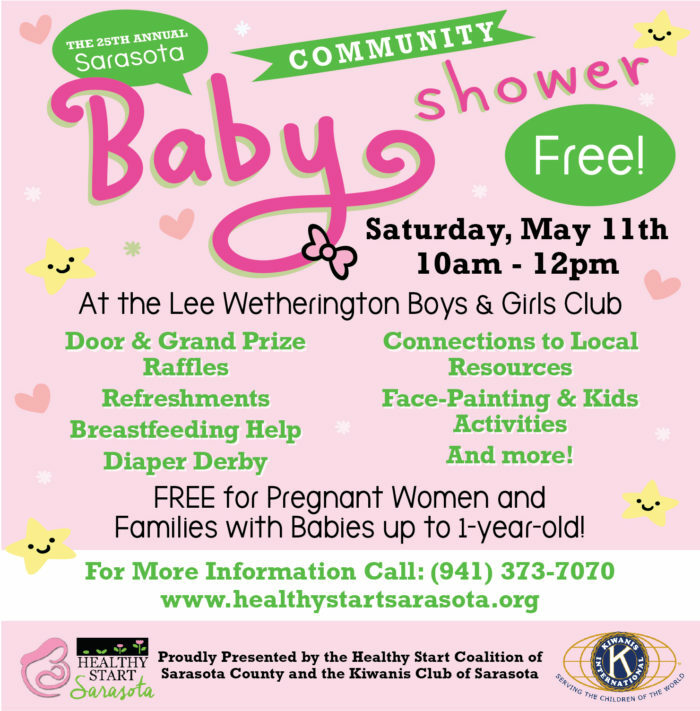 Saturday, May 11th, 2019 from 10 am - 12 pm at the Lee Wetherington Boys and Girls Club in Sarasota, in partnership with the Kiwanis Club of Sarasota. Pregnant women and families with babies up to 1-year-old are invited to join us for a fun, FREE, morning - Featuring exhibitors from dozens of local organizations, door prize raffles, giveaways, our world famous Diaper Derby, with the winner receiving a generous supply of diapers! The event ends with amazing grand prize raffle, featuring car seats, pack-n-plays, and other great baby items donated by the Kiwanis Club of Sarasota! © 2017 The Healthy Start Coalition of Sarasota County, Inc. Designed by Ciera Coleman. Photography by Peter Acker.